A program such as Martin Luther involves months of painstaking research, preparation and writing. 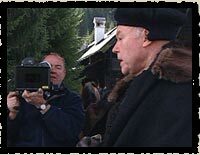 An experienced and skilled crew including a director, producers, director of photography, audio technicians, art department and editors shot Martin Luther across Europe in a host of historical locations. Over four months and more than 15 locations it often seemed like everything that could go wrong, did. Here the production team share a few trade secrets and tell what really happened. A chapel or church or both, a medieval library, a refectory or dining room, a kitchen or workroom or both, a study, a wash area, cloisters and a garden. They also needed a medieval street, a vast expanse of land and a forest (preferably close to the monastery location). Armed with this brief the producers scoured England and Europe. It was very important that the reconstruction scenes were historically accurate. The original Luther locations, which seemed the obvious choices had been renovated and modernised so they could not be used. The production team combed Great Britain looking for this fabled monastery that had withstood five hundred years and was still fabulously preserved. After several weeks they came to the realisation that finding all these facets in one place was not going to be possible, there were several aspects thwarting the search. The first factor was entirely Martin Luther's fault. The reformation he started combined with Henry VIII's own quarrels with the church had brought about the demise of many if not all of the monasteries from that era. Henry VIII for his part had dissolved them, split them up into churches or cathedrals, separate from their domestic buildings which often became schools. The other X-factor in the search was the Harry Potter films. The first few locations found, that had all or many of the requirements, were being used for the filming of Harry Potter for the next few years! In the end the team came across several locations in and around Winchester, capital of England in the middle ages. We filmed in Winchester Cathedral, an old monastic cathedral dating back to the 5th century, Winchester College (a boys school that's 600 years old), St Cross Hospital, a hospital and an alms house which dates back from the 12th century and Romsey Abbey that dates back to the 10th century. Between them the locations provided all the spaces the team were looking for, they even found what passed as a street within the grounds of Winchester College. They managed to find the open space and forest in a vast country park nearby and with the help of the ranger they chose a part that only had indigenous trees that would have been around in those days. Unfortunately the rest of the locations were no less easier to find, they all required similarly exacting historical accuracy. The production team filmed the Italian scenes in Rome and Umbria. The beautifully maintained Papal Palace was the Palazzo Caprarola, Viterbo's medieval square was where Luther's books were burnt and the beautiful church of Todi was used for documentary shots. The countryside around Umbria was combed for fields and tracks that looked as they would have 500 years ago. In Germany they borrowed a replica 16th century printing press from the Luther museum and found a local printer able to use it. They filmed in the gatehouse to Luther's house and filmed in and around the Harz mountains.The non-monastic scenes supposed to be set in Erfurt and Wittenberg we shot at Haddon Hall in Derbyshire, UK. The final and second most difficult location to find was the snowy landscape. In order to match the creative vision of the Director the crew needed to find somewhere that guaranteed snow in April, a medieval cart and some horses to pull it and a small medieval village where the cart journey would end. 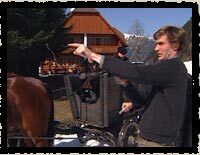 A fixer in Austria came to the rescue, she was not only convinced that snow would be on the ground for the exact days the crew wanted to film but knew a man who could create an authentic medieval cart and find the horses to pull it. Sounds simple? It was never going to be, having found the last snow in all of Europe during Fall, the crew found themselves shovelling snow from a nearby village to the location to consolidate the snow that was beginning to melt. To watch Luther you wouldn't dream of these hardships. The crew would like you to know that in every detail of the film, from the finding of the props, to the creating of the documents and right down to the teaching of young Luther to write with a quill, they were meticulous in their research. They'd also like to tell you that if you're looking for snow in Europe in late March you can't go past, the Harz Mountains...apparently. Go behind the scenes of Martin Luther, see the video.